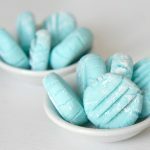 These easy to make homemade cream cheese mints are a perfect melt-in-your-mouth addition to any baby shower or party! It seems like there are seasons of babies in my inner circle of friends and family. We are currently going through a fun time with several new additions. 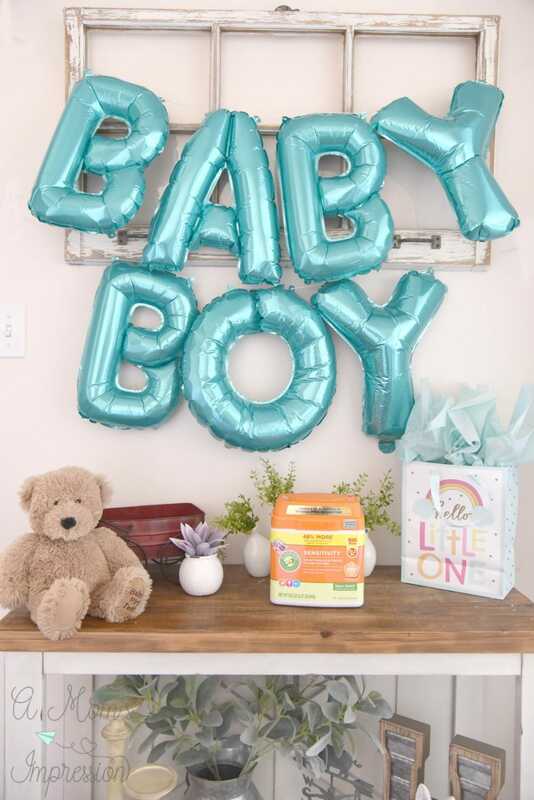 I have been having a lot of fun attending parties and helping plan celebrations to welcome new little ones! 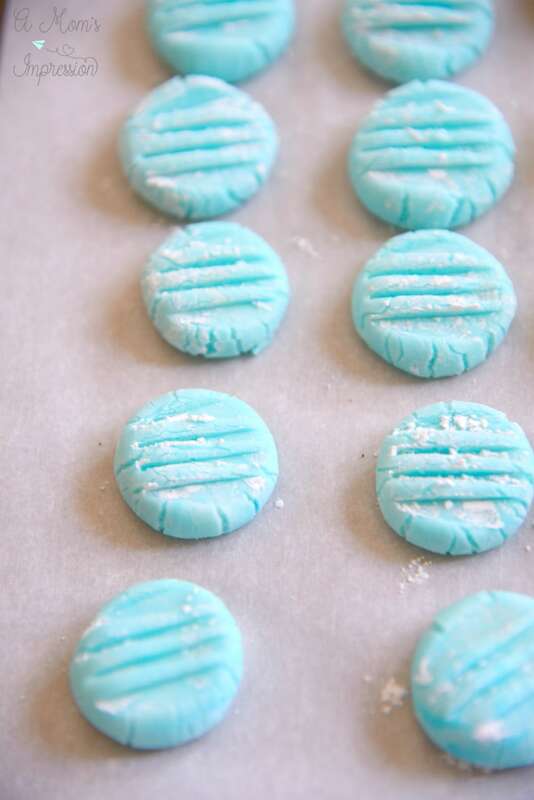 One of my favorite things to make for parties are these homemade cream cheese mints. This easy recipe will be a hit with everyone. I love them because it is simple to change them up for any occasion. All you need to do is change out the food coloring to make them perfect for Easter, Fourth of July, or Christmas. We were celebrating a baby boy, so naturally, I made mine the perfect shade of baby blue. Scroll on down to the bottom of this post for a complete recipe to print out. Often I get asked for advice for new moms during baby shower parties. 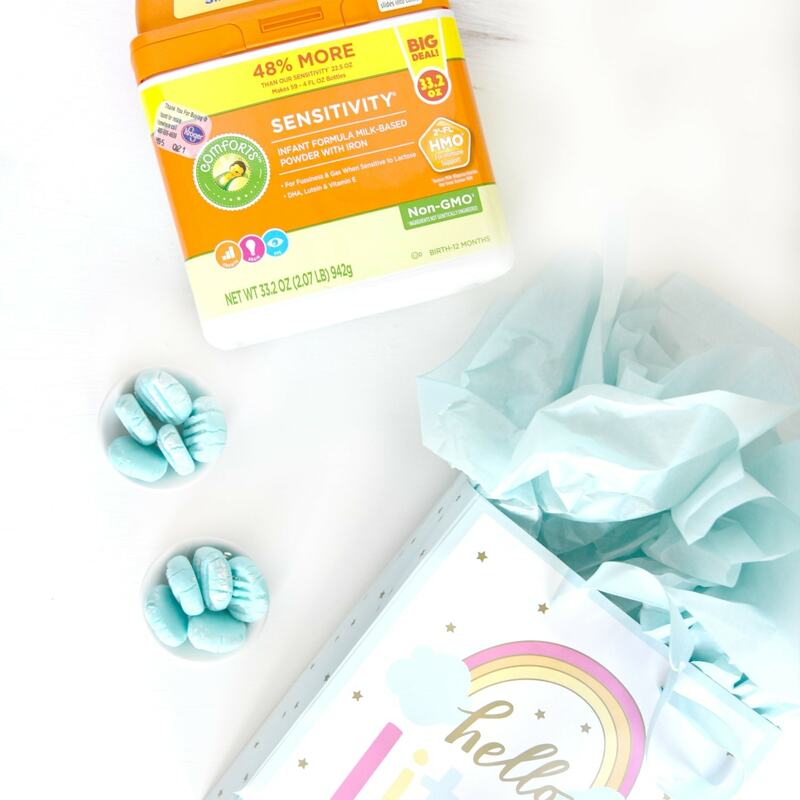 After having two kids, I do have a lot of wisdom to pass down to new parents, but the thing I keep coming back to is where to spend your money and where you can save on baby necessities. One of the best ways to save money is by purchasing the store brand infant formula over national brands. In fact, there can be a long-term savings of $400 over the name brands. My pediatrician told me that the nutrition in-store brands is high quality and is extremely comparable to those national brands. This is an area where you can save big! The other day I was shopping at my local Kroger store and I picked up their brand of infant formula for a baby shower I was attending. 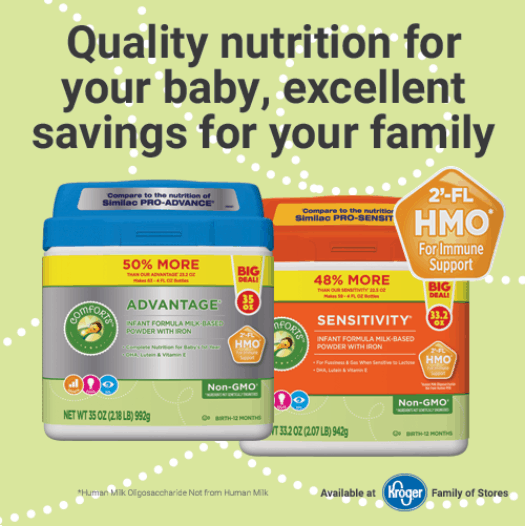 Comforts™ Sensitivity® Infant Formula and Comforts™ Advantage® Infant Formula feature 2’-FL HMO are now reformulated and available exclusively in Kroger banner stores. These are both comparable to some of the most popular national brands and are designed to suit your baby’s needs, no matter what those needs are. There are currently two formula’s available, Comforts™ Sensitivity® Infant Formula and Comforts™ Advantage® Infant Formula. They both feature HMO, a human milk oligosaccharide, which is a prebiotic that helps establish beneficial bacteria for immune support. HMO is found in most mother’s breast milk so it can help a formula feed infant to get the same nutrition as a breast milk-fed infant. An added benefit is that this formula is less expensive than its name-brand counterparts. As any new parent can attest, having a baby in the house can be pretty expensive and any ways we can save is welcome. I suggest using the money you are saving on infant formula for a well-needed massage or a nice cup of coffee at the coffee shop down the street. New parents are full of stress and we all need ways to unwind and relax! Now is the perfect time to stock up on Comforts™ HMO Infant Formula! 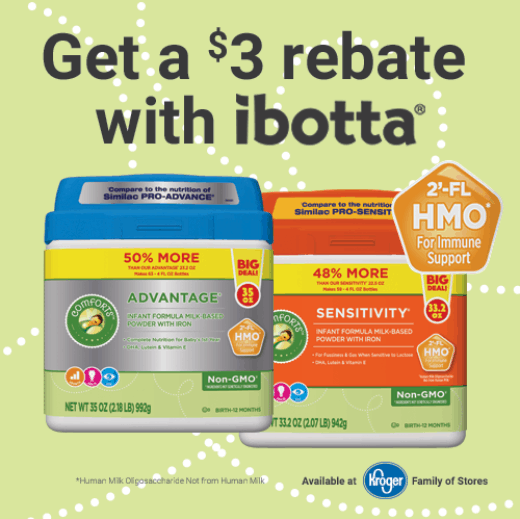 There is an awesome Ibotta offer currently available for this fantastic Infant formula at Kroger. 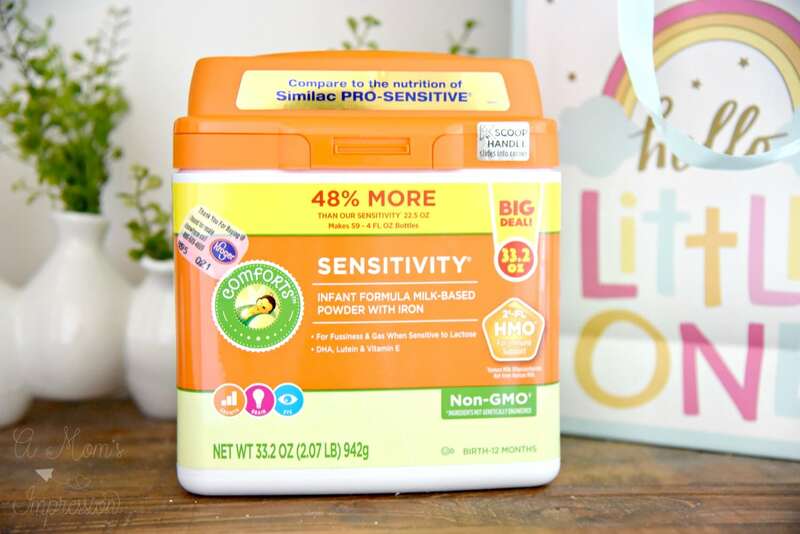 Click here to learn about the $3 off of one Kroger Comforts Formula (any variety, 30 fl. oz. or larger) Ibotta! This offer can be redeemed up to 2 times per receipt. 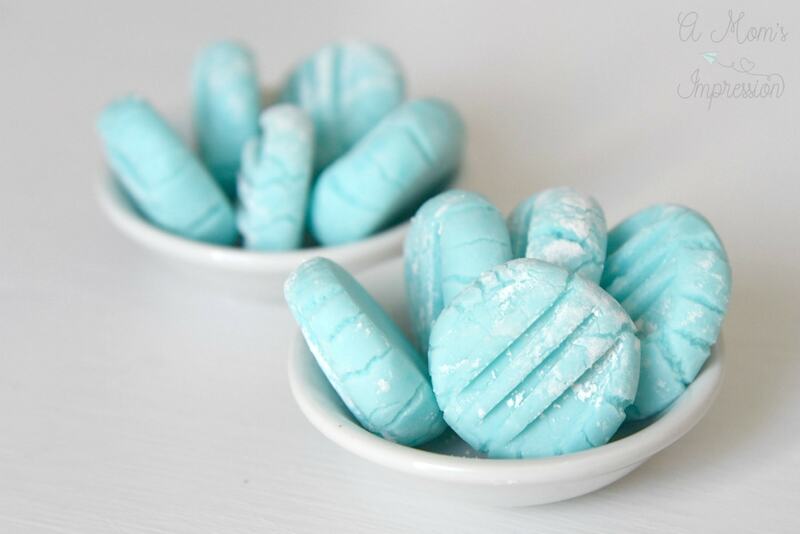 These easy to make homemade cream cheese mints are a perfect melt-in-your mouth addition to any party! Combine cream cheese and butter in a mixing bowl. I like to use my stand mixer for this as there is going to be a lot of mixing going on. When the mixture is well-combined add in your mint extract. Stir to combine. Reserve a 1/2 cup of the powdered sugar in a small bowl. Slowly incorporate the rest of the powdered sugar into your mixture until stiff and well combined. If you are only using one color, add a few drops of your gel food coloring into your mixing bowl and stir until the desired color. If you are doing multiple colors, divide the mixture between several small bowls and stir in your desired gel coloring to achieve your colors. Take a small amount of the mixture and roll into a ball, about 1 inch. 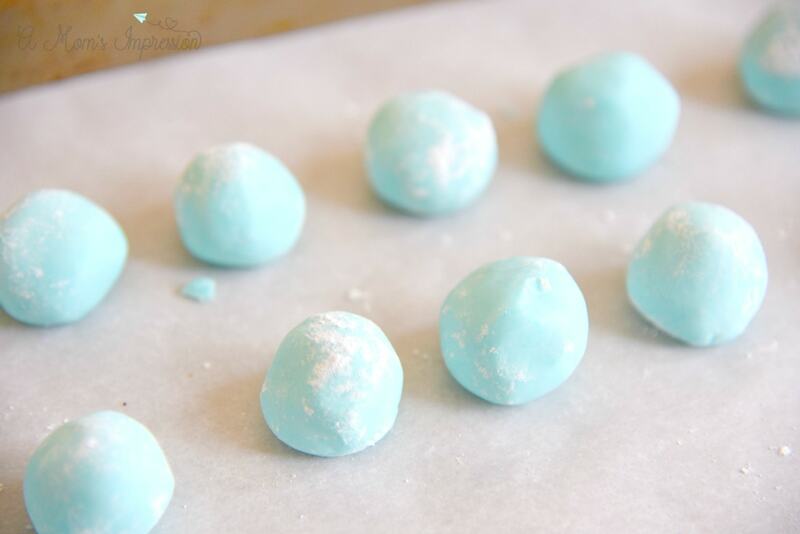 Drop ball into your reserved powdered sugar to coat and give it a roll in your hand. Place on a parchment lined cookie sheet and repeat for the rest of the mixture. Using a fork, press it down onto the balls to flatten them. I found if I dipped the back of the fork into the powdered sugar first, it is less likely to stick. Let harden for about 4 hours, flipping them halfway. Store in an airtight container for up to 2 weeks.